Alvernia is a new football team playing its first season in 2018. FDU-Florham and Wilkes have new helmet designs in 2018 (shown above). In 2017 Delaware Valley had a new design with a script "Aggies" logo similar to one used by the team in earlier years - I will need a copy of this logo in order to add this helmet to the website (I lost the copy I once had during a hard drive failure years ago). 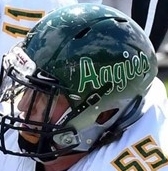 The helmets are apparently dark green with an airbrushed silver section around the bottom (photograph below). The 1992 Albright helmet design has been described as having a silver shell, one red stripe, and a red "paw print" logo on the sides. *1 This helmet design featured a wide, white central stripe, flanked by a narrower black stripe on the left side (as shown above) and a red stripe on the right side (not visible from this "angle"). This team had a new helmet design for the 2012 season. 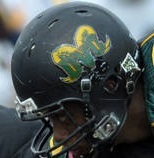 An apparent switch to black helmets was made, with a new logo consisting of the letters "DVC" with "rams' horns" (see photo below). I will need a copy of the artwork for the helmet logo in order to add this one to the web site. This design apparently remained in use in 2013. The helmet design used immediately prior to the first one shown above has been described as having a dark blue shell, white facemask, and the same logo as was used from 1996 through 2000. *1 King's apparently used plain gold helmets from at least 1999 through 2013, but in 2014 added red uniform numerals to the right side only of each helmet (as shown below). The 2017 design also has these numerals. *2 This design is "blank" on its left side but has uniform numerals on its right side (as represented below). In 2014 LVC used a helmet logo of the team nickname "Dutchmen" in arched letters, as shown below; I would need to get a copy of this new helmet logo or decal in order to add this one to the website. This team played its first season of football in 2012. 2011 was the first year of varsity play for the Stevenson football team. Apparently for a small number of games in 2012 another logo was used by the team - the school name "STEVENSON" in silver letters, possibly with white outlines (see photo below). I would appreciate a clearer photograph of this helmet design. *1 In 2013 and 2014 Stevenson used numerals on the left side only of each helmet; on the right side was worn an "S" logo (as shown below). *2 Uniform numerals are present on the left side of this design only; the right side features an "S" logo (as shown below). 1970 - ? ? - 2004 2005 - ? *1 The "PMC" on this helmet refers to PMC Colleges, which was the name of the school prior to 1972. PMC stood for both Pennsylvania Military College and Penn Morton College (the civilian component of the school).